I muddle Hoja Santa to add flavors and aromas of licorice, anise and sassafras. Native to central and southern Mexico and all of Mesoamerica, this ancient plant is a member of the genus, “piper,” same as the Indian black pepper plant. It’s used to flavor chocolate, to cook tamales and is added as flavoring to chiles rellenos. It is the base for a delicious Oaxacan green mole. The hoja is also used to wrap fish that is then baked. Here I’ve turned it into a cocktail. 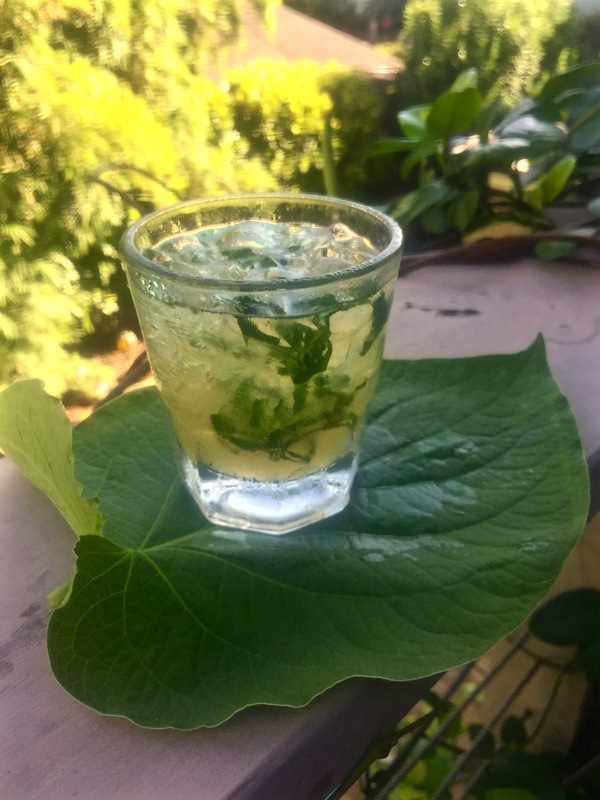 On summer weekends, I muddle the leaves in mezcal or tequila. It’s aromatic and refreshing. so I suggest that you take a cutting from someone who has one in the garden and grow your own. An Hoja Santa plant is 6 to 7 feet tall and is fairly easy to grow, so long as it has sun and plenty of water. 3. Add the lime juice and agave nectar and mix thoroughly. 4. Fill old-fashioned glasses with crushed ice and pour the muddled mixture. I think I’ll order myself an “Hojita” !